Team U Mumba Are In It To Win It! Representing the financial capital of India, team U Mumba is the official PKL team of Mumbai city. 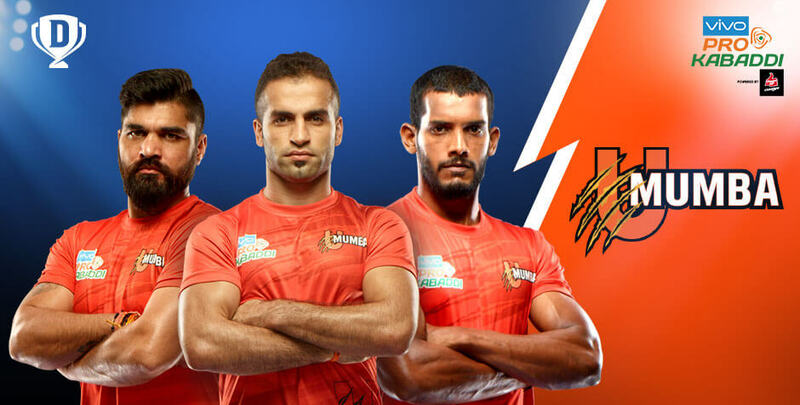 Being the first team from Maharashtra in the PKL, (the second being the Puneri Paltan) the U Mumba squad is among the most successful teams in the franchise. Entrepreneur Ronnie Screwvala is the U Mumba owner and the five thousand capacity Sardar Vallabhbhai Patel Indoor Stadium is the home turf for the U Mumba team. Team U Mumba coach Gholamreza Mahmoud Mazandarani is the first foreign coach in the history of the franchise. With an illustrious list of U Mumba players and their comfortable position on the leaderboard, the team has consistently delivered quality performances across seasons. Team U Mumba came close to winning the championship in season one of the PKL but was defeated by the Jaipur Pink Panthers. This began a fiery rivalry and they came back in season two to win the title in 2015. The leaderboard has a lot to say about the U Mumba Kabaddi team. They finished as the runner-up team on three occasions and have won the title once. They finished fifth in season four and were out in the group stage in season five, their lowest in five PKL appearances. After a brilliant track record, back to back dismal finishes have critics questioning if the team can back into their lethal competitive form. Here are some more facts and statistics to know more about team U Mumba. The team has played over 60 matches in the league and won over 40 of them, a testament to their brilliant past track record. U Mumba has reached the finals on 3 occasions, finishing as runner-up twice and has won the tournament once. Team U Mumba captain Fazel Atrachali from Iran is internationally acclaimed for his raiding skills. He has been a part of the winning PKL teams of U Mumba and Patna Pirates in the respective years. Fazel has been in the PKL finals on four occasions, the most for any foreign player. Veteran defender Dharmaraj Cheralathan has an illustrious list of accolades, which include a gold for the national team and successfully captaining the Patna Pirates team to the championship victory in season four. Dharmaraj Cheralathan’s ankle hold grip is one of the fiercest in the sport. He leads the defence of the team with tactful accuracy and led the super tackle count of season four. Iranian raiding specialist Abolfazl Maghsodloumahali has been part of the PKL since season three and won the championship title with Patna Pirates in season four. In season five, he ranked second highest on the list of most raiding points by a foreign player. U Mumba is ranked second best for all-outs inflicted in five seasons of the franchise. The team also features in the top five for the tally of raid points, tackle points, and total points. Part of Zone A, U Mumba will see some grand battles in season six against the Gujarat Fortunegiants, the Puneri Paltan and former champions Jaipur Pink Panthers. Team U Mumba points table has been known to consistently move to the top. On a good day, this team is sure to steal a ton of points to race higher on the leaderboard. The U Mumba team 2018 looks promising and with the wind in their sails, they are ready to take a quick lead this season. Delve into the world of sports action with the coolest sports strategy portal. Dream11 lets you play selector and put your planning skills to the test. So, go ahead and create your list of raiders, defenders and all-rounders before every game and get rewarded for your selections. Play for fun or invite your friends and challenge them to a duel. Turn up the difficulty by signing up for contests with the pros in the contests and mega contests on Dream11. To experience all that and a lot more, log on to Dream11 on the official website or access from anywhere through the Dream11 app on your smartphone.